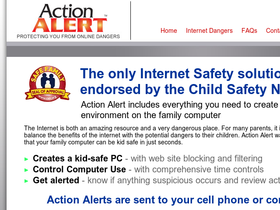 Get Action Alert, online at ActionAlert.com, the internet safety solution endorsed by the Child Safety Network. Action Alert knows that the internet is both an amazing tool connecting billions and also a very dangerous place, especially for children. So Action Alert was created as a way to help parents monitor and control their kids' online activity. Action Alert offers tools, such as site blocking, time allowance, activity video recording, notifications, access control, chat and email logging, and more. Plus Action Alert offers a free version of protection that parents can set up in seconds. Also Action Alert makes it easy for parents to monitor and control through their cellphones. So make online safer for kids with help from Action Alert, and be sure to get all the latest ActionAlert.com discounts, Action Alert promotions, and Action Alert coupon codes found here at RetailSteal.com. Go to Action Alert today and enjoy free internet safety software. Click here to start. Turn to Action Alert and save with free parental control software. Click here to get started today. Go to Action Alert and get Maximum Protection parental control software, including full social network monitoring, for only $29.99. Click here to get started.